I’m so excited to present my first ever guest post by my good friend Allie!!! With the name Allison, she was given the nickname “Owlison,” as she has a slight admiration for these cute, trendy animals. For Halloween this year, Allie became inspired by this Owl costume found via Pinterest and she made her own version for a neighborhood party! Take it away Allie! I cut the stitches out of the collar and pulled the collar out. I also cut off the sleeves. 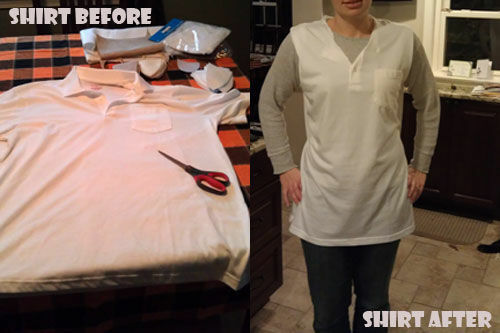 I turned the shirt inside out and my fiance pinned the excess width to the back of the shirt – it actually looked like wings sticking out the back. I also pinned the tops of the shoulders of the sleeves so they would be more like a tank top sleeve instead of a cap sleeve. I pinned down the front button area to make a V. Lastly I pinned the arm holes closed an inch or two more than they were originally. 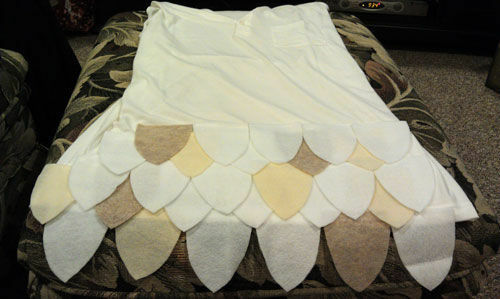 A month before Halloween, I made a pattern and cut out many “feathers” from the white, light brown and beige felt. Starting at the bottom, I used fabric glue to attach the feathers to the shirt. Tip: Randomly select colors layer in a brick style pattern. 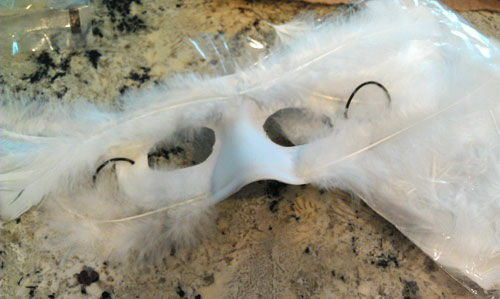 For the mask I cut the eye holes larger and used hot glue to attach a few white feathers. On the day of the party, I paired my top and mask with a white long-sleeve shirt, tight black pants and black shoes. I was all set to stay warm on this rare October day in which it SNOWED! 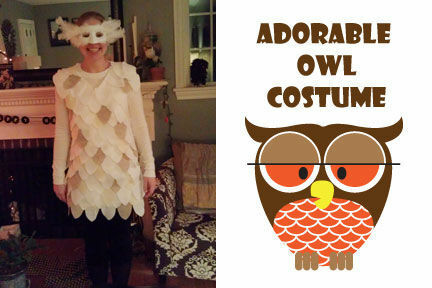 A special thanks to Alllie for sharing her ADORABLE Owl Costume with my blog readers!! Isn’t she cute? Awesome costume! I love the colors.